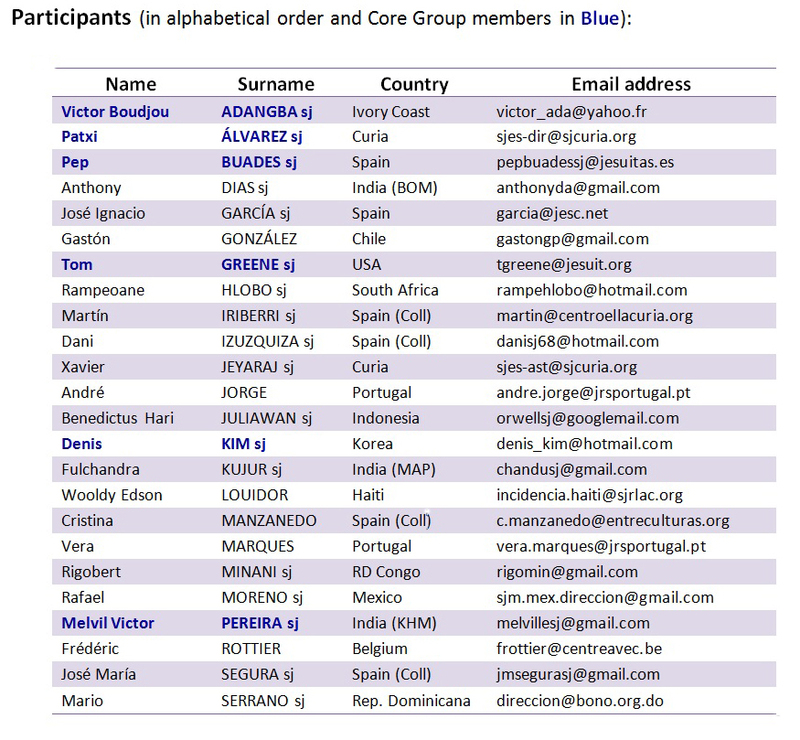 During the last year the Core Group members coming from the different Conferences have prepared a narrative report of the internal and external mappings. It is a very well done job that will give you an idea of how the Society is responding to the situation of migrants at the global level. In our workshop in September we will have time to listen from the Core Group members the contents of these narrative reports. They will focus in those areas that might be most useful for a global network. 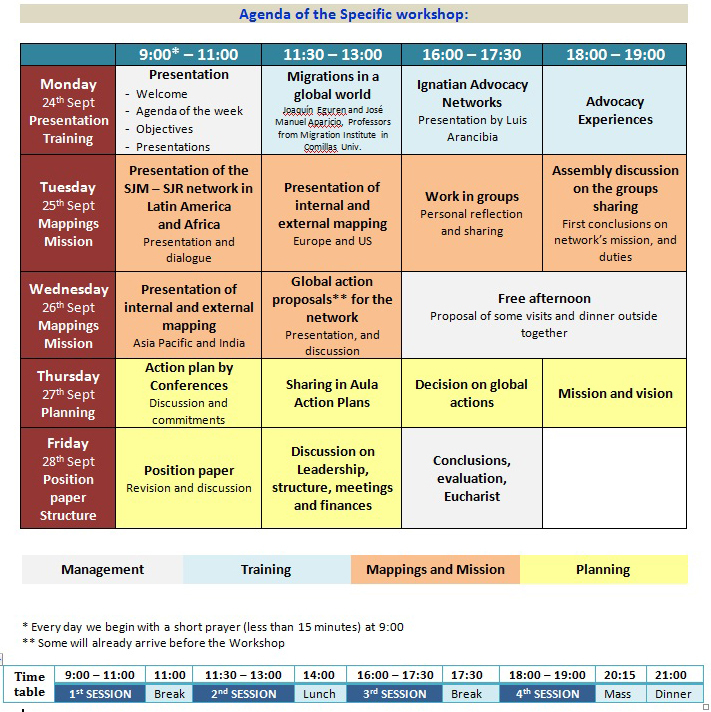 It is good if you can have a look at the reports before our workshop. You have them at the bottom of this page. If you want to open the documents, you just have to double click on the icons. The documents are all in English except the one from Africa which is in French. For those of you who cannot read it, wait for the presentation that they will do in Madrid. Printed copies will not be provided. Provide unity, consistency and effectiveness at a global level to the responses that the Society gives to migrants and displaced people. 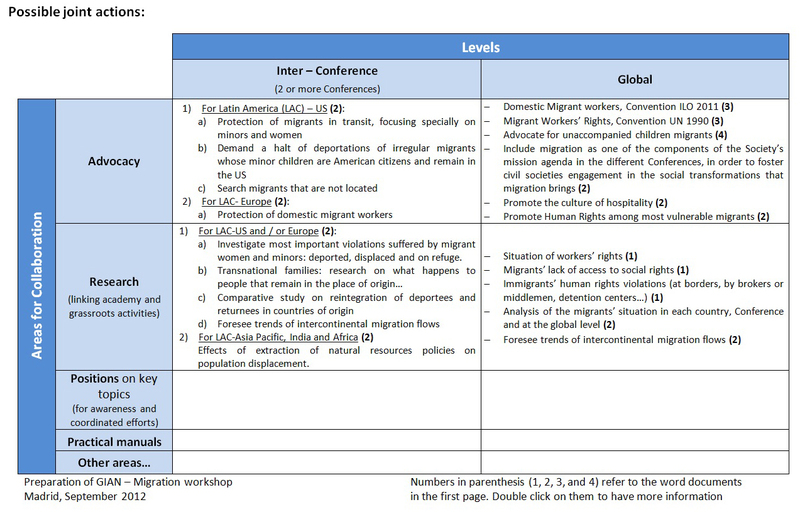 a) Promote and defend the human rights of vulnerable migrants and displaced people and their families, through an advocacy based on pastoral and social accompaniment, research, training and promotion of migrants’ organizations. b) Face the structural causes that provoke the different types of human migration. c) Raise awareness in the societies of our Conferences, so that they may think and assume the social transformations that migration, displacement and refuge bring. d) Link the Society with other networks and initiatives (civil or Church ones) that are dealing with migration, taking part in global campaigns that other networks are promoting. 3) At the Conference level each member of the Core Group should have a coordination team where the different interprovincial regions may be represented. 4) At the regional level (several Provinces) only those institutions that already have some advocacy experience should take part.